"There is no wrong or right in this place. You're just choosing not to see it." 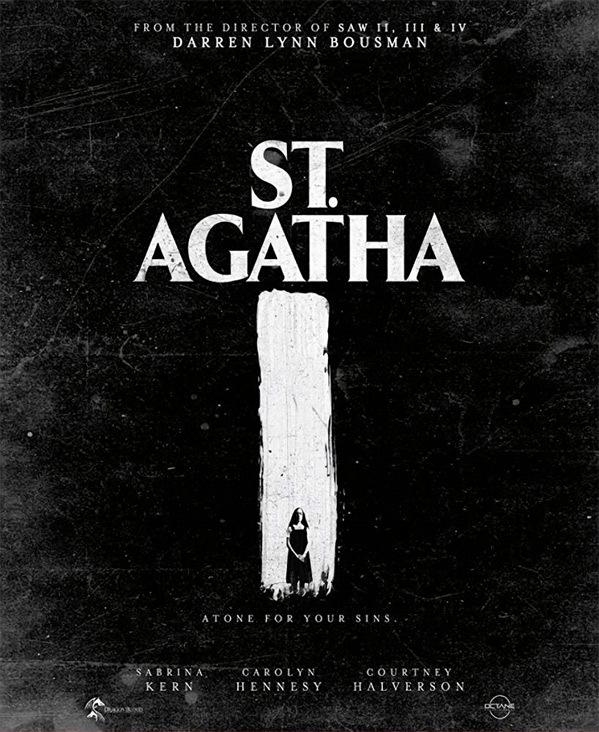 Signature Entertainment in the UK has debuted the official UK trailer for an indie horror thriller titled St. Agatha, the latest from horror director Darren Lynn Bousman (Saw II-IV, Repo! The Genetic Opera, Mother's Day, The Devil's Carnival). This new "twisted horror thriller" is said to push the boundaries of the "nunsploitation" genre, in a story set at a convent in Georgia. A pregnant young woman named Mary ends up there, seeking shelter only to be met with an unsettling and horrendous evil waiting on the other side. St. Agatha stars Sabrina Kern, Carolyn Hennesy, Courtney Halverson, Trin Miller, Lindsay Seim, Hannah Fierman and Seth Michaels. The footage from this trailer does look freaky, especially near the end when it goes all out crazy. Scary stuff. Set in the 1950s in small-town in Georgia, a pregnant young woman named Mary (Sabrina Kern) seeks refuge in the local convent. What first starts out as the perfect place to have a child turns into a dark layer where silence is forced, ghastly secrets are masked, and every bit of will power Mary has is tested as she learns the sick and twisted truth of the convent and the odd people that lurk inside its halls. St. Agatha is directed by American horror filmmaker Darren Lynn Bousman, of the films Saw II, III, IV, Repo! The Genetic Opera, Mother's Day, 11-11-11, The Barrens, The Devil's Carnival, and Abattoir previously. The screenplay is written by Andy Demetrio, Shaun Fletcher, Sara Sometti Michaels, and Clint Sears. The film premiered at The Overlook Film Festival earlier this year, and played at a few other genre fests around the world, including Fantasy Filmfest, FilmFear, and the Morbido Film Fest. There's no US release date set yet.